Life takes you on many journeys, and it’s fair to say Nick Uranga’s officiating journey has picked up pace in 2016. Like many of his peers, he started out at an early age – 12 to be precise – with his refereeing father being a heavy influence. Fast forward to today and the 26-year-old has made his top-level debut in North America, taking the flag in MLS at MAPFRE Stadium for Columbus Crew versus San Jose Earthquakes in Week 25, and he’s now preparing to run the line in the NWSL Championship. He’s quick to praise those around him, though, as his focus turns to the game on Sunday October 9 at BBVA Compass Stadium. “Overall, the last few weeks have been quite an experience on my referee journey,” Uranga reflected to proreferees.com after receiving has call-up to the NWSL showpiece match, between Washington Spirit and Western New York Flash. “Foremost, to be considered in the same pool with the top professional officials in North America is a tremendous honor and humbling. “It is a privilege to be considered on a final at the highest level for women’s soccer. I have seen how much women’s soccer has grown on and off the field and it’s truly humbling to be a part of their history. Western New York advanced to Sunday’s Championship in Houston for the second time in four years with a 4-3 extra-time victory over Portland Thorns in the Semifinals. Washington also needed extra-time to defeat Chicago Red Stars, with Francisca Ordega’s winning goal seeing them advance from the Semifinals. 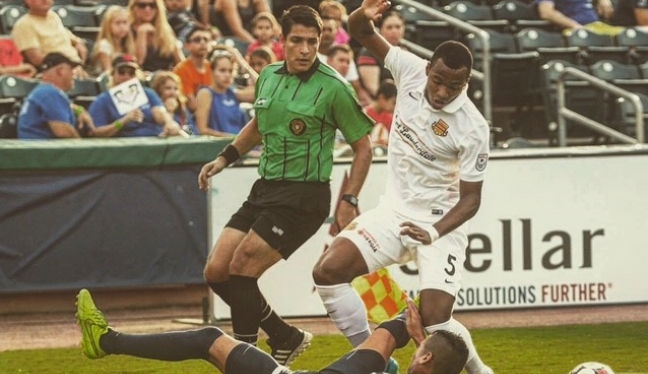 The other team in Houston – the officials – will be headed up by center referee Matthew Franz, with Uranga assigned as AR2, Alicia Messer as AR1 and Margaret Domka on fourth official duties. Francisco Bermudez is the reserve AR. “I try not to change my normal routine before any match, especially a final,” Uranga, who lives in Atlanta, GA, added. “I continue to train physically as I normally would. I will watch both semifinals to study playing styles, tactics, key players, etc. to ensure I’m mentally prepared as well. “I have worked with each official in the past and I’m looking forward to doing so again. They are true professionals – on and off the pitch. It will be a wonderful experience. The pre-Championship attitude Uranga possesses is similar to the one he maintained prior to his MLS debut in Columbus. 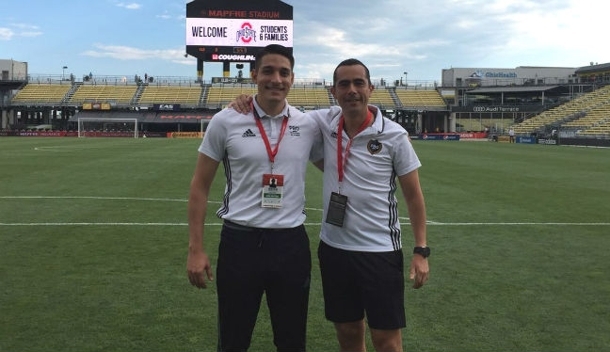 The official describes that experience as “incredible” and is now hungry for more at the top level of North American soccer, as he continues his journey. “My MLS debut required a tremendous amount of mental preparedness that started from the minute I received the assignment. I knew going into the match I had to stay in routine as much as possible. “The crew – Ismail Elfath, Peter Manikowski and Jaime Herrera – were fantastic and true professionals. As we were walking out, I made sure to soak in the atmosphere. You never get another ‘first game’ feeling like that. “I got a taste of the highest level and loved it. I will continue to work even harder – physically, mentally and emotionally – to prepare for the next challenge that comes my way. “In the short-term, my focus is on the NWSL Championship but I am looking forward to any new challenges that may be presented – but I realize patience is key.